We continuously have new paper craft creators, Joko Mulyanto is one of them, who also a PERI member. 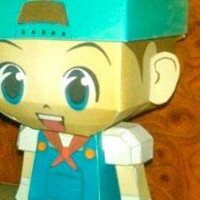 He created a boy paper craft who is a main character from the famous PS1 game "Harvest Moon : Back to Nature". This character does not have a name because gamers can named this boy with whatever they want. Joko can't find any of this character made into paper craft in internet, there is only a dog character, so he made one for himself. He drew this patterns in one night and assembled it in a half an hour. This template is very simple, only has two pages of patterns. 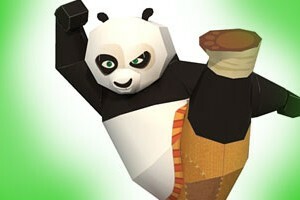 We have a new papercraft template designer, he is Dudi Julianto who is also a PERI member. This paper craft as he said is his first try-out in making the template using pepakura designer. 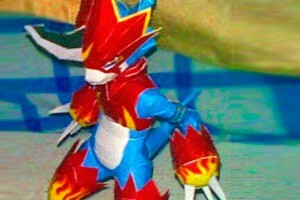 This Flamedramon is only one from almost a dozen patterns that he already made. In my opinion this is a very good work for the first time in designing paper craft. His modeling skill is very good in making low poly model but still in detailed shape, making this flamedramon a good looking paper craft you should build if you like paper craft template in pdo format. The template contains of 5 pages of patterns. Dudi has given me permission to host his Flamedramon template in Paper Replika. This model was a paper craft template bonus inside Kiddo Magazine. I design this template as commissioned by Kiddo Magz. This template is quite simple, only 2 pages. At first I doubt this Po model will looks good because I only had 2 pages to fill, and because the curvy shape of that panda, but it turned out good in the end result. I’m quite happy about it. The reason I share this because I found this template was shared in the net, and because the template is without any mark, so I release this. If you found that template please delete it and replace it with this file. 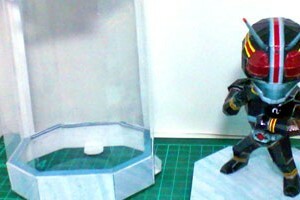 This template was submitted by Ongo Arts to give you a way to protect your Kamen Rider paper craft from the element. He designed this display container to be open and close able, so you can still put your paper figure out of the box for display and return it again to the container when you're done with it for storing. Storing your papercraft inside a container is known to help pro-longed the paper craft color age, beside coating your paper model with thin clear varnish or by using specialized long lasting ink. I heard there is a printer ink brand that promote their 100 years long lasting ink. Ongo Arts suggested to use a transparent plastic or celluloid and 190 gsm paper or more to build this container, in the photos below Ongo Arts used a Yasica celluloid sheet for projector. This template contains 8 pages of patterm and 4 pages of assembly instruction. 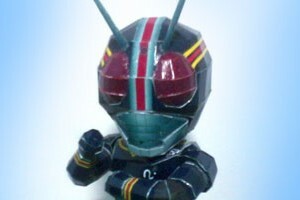 This Kamen Rider Black SD (Super Deformed) template was designed by Ongo Arts. This is his second template shared on Paper Replika. The template only has 3 pages and the assembly instruction is include in this file. There is an improvement on how he divide the parts, now all the parts are modular. I also want to let you to know that on this night from 8:30 PM to 9:30 PM Paper Replika will participate in Earth Hour 2012, therefore Paper Replika site will temporary offline on that time.